While the concept of deep learning has existed for quite some time, the industry has not progressed as quickly as many had hoped, simply because the technology required to effectively process the utterly massive amounts of available data was just too weak. Too few companies and organizations possessed supercomputers with enough processing power to make headway. One of the companies that did, however, was International Business Machines. As far back as the early 1950s, IBM was heavily involved in the development and teaching of computers to analyze data and make independent decisions based on their experiences. A notable example was IBM’s checkers-playing program written by Arthur Samuel in 1952, which eventually learned enough and evolved to the point it was able to win a game against a human champion in 1962. More than three decades later, IBM’s Deep Blue chess-playing computer beat world champion Garry Kasparov in a six-game standard chess match in May 1997. Of course, it took IBM more than 12 years to successfully train and develop Deep Blue, but the match against Kasparov was a monumental leap forward for IBM in the AI and deep learning arenas. Fast-forward to 2011, and IBM’s latest game-playing creation, Watson, beat Jeopardy!’s all-time (human) winner, Ken Jennings, who had previously won a record 74 games in a row. Watson wasn’t perfect, though, despite the massive teams of computer engineers and developers who created the bedroom-sized supercomputer. However, continued advancements in technology allowed IBM to shrink Watson down to the size of “three stacked pizza boxes” just a few years later. Those technological advancements, which include not only making machines and computers faster, but smaller as well, have continued to be a focal point for IBM’s deep learning endeavors, not to mention the eventual commercial applications for Watson. The company’s research and development efforts recently culminated in the creation of the TrueNorth computer chip, hailed as a giant leap forward in pushing the potential of artificial intelligence and deep learning capabilities. In case you didn’t know, your computer’s graphics processing unit, or GPU, is actually capable of quite a bit more than merely displaying high-definition pictures and videos on your monitor. In fact, today’s high-end GPUs are frequently used for a multitude of tasks that often have nothing at all to do with videos. Nvidia is the undisputed leader in the GPU market, having recently pulled so far ahead of it’s top competitor, Advanced Micro Devices, Inc. (NASDAQ:AMD), that it’s unlikely AMD will regain any significant amount of that lost market share. NVDA stock advanced to the front of the pack not just because its GPUs were reliable and extremely cutting-edge, but because they were affordable, too. Nvidia took advantage of a series of AMD mistakes that led to delayed releases and poor hardware performance, and management has continued to push out new products that expand the boundaries of the semiconductor industry. In an effort to further the functionality of its continually improving line of graphics processors, the Nvidia SDK developed a flexible framework with which other companies and organizations can implement machine learning algorithms to improve the deep learning analytic capabilities of their own systems — of course, only available with NVDA’s own line of high-end GPUs. These two tech powerhouses together have the potential to make leaps and bounds in the fields of deep learning and artificial intelligence. 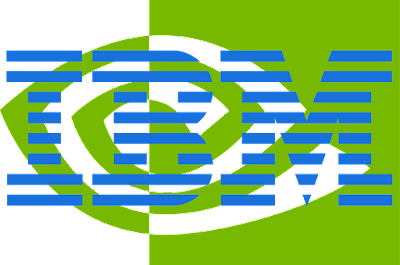 This could be a boon not only for the technology industry and, later, the world, but for IBM and Nvidia stock investors as well. It’s true that the capabilities and global applications using true deep learning are relatively small, but harnessing the resources and expertise of International Business Machines and NVDA should lead to significant forward progress. Considering the sheer speed with which technology evolves on a general basis, combining the most advanced parts of these two technology big dogs is bound to result in some monumental outcomes. For investors, this makes both IBM and Nvidia stock solid picks for long-term portfolios, which will ultimately benefit from both price appreciation and dividend growth. International Business Machines stock is up nearly 73% over the past ten years, and its historical dividend growth rate has been 20.4% over that same period. NVDA stock is up a whopping 296% over the last decade, but didn’t begin paying dividends until 2012. However, since then, the Nvidia stock dividend has a 3-year CAGR of more than 71%. With both International Business Machines and NVDA leading the deep learning race, it should be safe to assume that their partnership and cooperation in this field will help to secure the stocks of both companies. Since this development was only recently announced, it’s unlikely that current IBM and Nvidia stock owners will see any notable increase in share prices, but they will as things evolve.